In the late 1930s Jean Renoir was at the peak of his directorial career, turning out a string of film destined to be classics, including Le Crime de Monsieur Lange (The Crime of Monsieur Lange, 1936), La Grande Illusion (Grand Illusion, 1937), La Bête Humaine (The Human Beast, 1938), and La Règle du Jeu, (The Rules of the Game, 1939). La Bête Humaine, based on Émile Zola’s well-known 1890 novel, offered a mixture of styles that combined his characteristic humanism with a more fatalistic vision of people unable to overcome the dark forces controlling not only their destinies, but their very own actions, as well. Zola’s La Bête Humaine was part of his Les Rougon-Macquart cycle of interlinked novels tracing the fortunes of several families over a number of generations. These “naturalistic” stories focused on the deleterious effects of overweening greed that he felt dominated the late 19th century industrial age. In addition he also seemed to have had questionable theories concerning the hereditary influence that ravenous appetites, such as indulgence in alcoholism and violence, had on the offspring of such greedy parents. Presumably out of respect for Zola’s original work, Renoir’s film does refer to this unsound theory when he has Lantier say that he felt he was “paying for all those grandfathers and fathers who drank – all those generations of drunkards who poisoned my blood”. But Renoir’s focus in his own version of La Bête Humaine was more personal and existential than Zola’s broader, and supposedly more “objective”, social commentary, and this was definitely a felicitous path to follow. 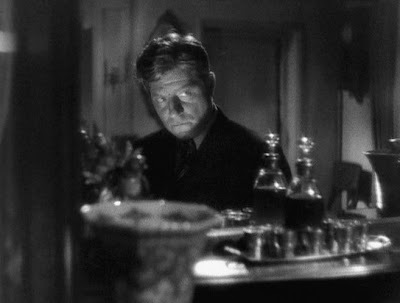 Jacques Lantier (played by Jean Gabin), a railroad engineer on th e Paris to Le Havre run. Pecqueux, Lantier’s close workmate and the stoker (French: “chauffeur”) on that train run. Monsieur Roubaud, the local station master at Le Havre. Renoir presented the story of Zola’s lengthy and involved novel of more than four hundred pages by organizing it into essentially four sections or “acts”. 1. Introduction of the Principal Characters (23 minutes). The film opens, memorably, with a justly famous sequence of the steam engine speeding on the rails towards Le Havre. 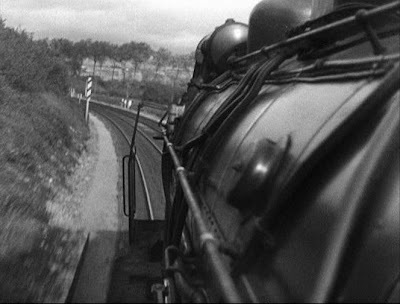 For about seven minutes the film shows the train from the perspective of the two operators, Lantier and Pecqueux, as they communicate by hand signals due to the noise of the roaring engine. This was an amazing feat of cinematography for the time, because it included some tracking shots inside the engine cab carried out while it was moving at speed. 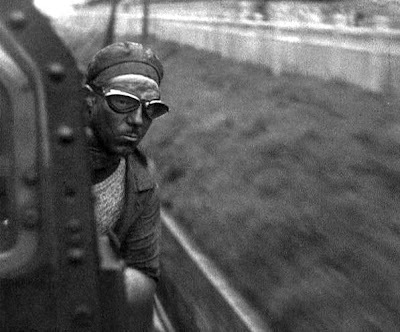 Renoir also had a cameraman sitting on the cowcatcher of the train in order to shoot head-on point-of-view shots as the train moved across railroad bridges and through tunnels, all a high speed. The impression one gets from this scene is that of the overwhelming power and speed of the train, and, by implication, the pace of “modern” life, which is beyond the means of the people who are trying to maintain it properly on its course. When the train enters and stops in the Le Havre train station, Lantier discovers that the engine needs repairs, and he and Pecqueux are told to cool their heels in the area for two days. We are also introduced to Roubaud, the local station master, who dotes on his pretty and much younger wife, Séverine. After an argument with a wealthy and prickly passenger, Roubaud presses his wife to come with him to Paris and get Grandmorin, her godfather and a director of the railroad company, to protect his job. Meanwhile with some time on his hands, Lantier goes to the nearby village of Breaute-Beuzeville to visit his aunt. Her daughter, his cousin Flore, he finds has grown up to be an attractive woman. But while in the act of embracing her in a local field, he has a fit and almost strangles her, before a passing train snaps him out of his manic trance. Afterwards he confesses to her that this temporary madness is his permanent medical condition that he does not know how to overcome. These opening scenes provide the basic character development of the principal roles. Roubaud is a proud individual, concerned with how others see him. His pretty wife, Séverine, is gentle, but a bit of a coquette. Lantier and Pecqueux are good, solid, working-class, individuals, but Lantier suffers from a mysterious temporary form of madness. 2. Roubaud and Séverine (31 minutes). Roubaud and Séverine visit Paris, where Séverine visits Grandmorin and accomplishes her mission. However the emotionally insecure Roubaud becomes jealous about Grandmorin, and when he abusively questions his wife, he learns that she was once Grandmorin’s mistress. Furious, he forces Séverine to join him in a plot to kill Grandmorin on the train back to Le Havre. They accomplish the murder, but they are observed by Lantier, who was also on the train, returning from Breaute-Beuzeville.. When the police investigate the murder and interview all the passengers, however, Lantier withholds testifying against Roubaud and Séverine. The police magistrate falsely accuses someone else, the lower-class poacher Cabuche (played by Jean Renoir, himself). Nevertheless Séverine is suspicious that he might spill the beans, and she resolves to make friends with him. At the same time she informs her husband that the murder has made him repulsive to her and that she doesn’t want him to touch her any more. 3. The Affair with Séverine (22 minutes). Lantier grows amorous towards Séverine, but she tells him that she only wants to be his friend, not his lover. Meanwhile, Roubaud, ignored by his wife, has become gloomy and aimless, and he spends more and more of his time gambling and losing money. One rainy night, while Roubaud is out gambling, Lantier arranges to see Séverine, and their mutual passion finally flares up and is unleashed. They make love in an empty rail-yard toolshed. Then they make plans to ambush Roubaud in the dark and kill him, but in the event at the critical moment, Lantier loses his nerve. At this point Roubaud, who had been a pole of focalization up to this point, pretty much vanishes from the story, and his murder of Grandmorin is never resolved by the police. 4. Meeting at the Dance Hall (25 minutes). Now Séverine keeps her distance from Lantier. He makes another train run to Paris and back, and he sees her at a dance hall, now carousing with another man. When he confronts her, she tells him that it’s all over between them, because he cannot do what must be done to make her happy. He goes back to her place and promises that this time he will not lose his nerve and will carry out the murder of Roubaud for sure. She is finally convinced and agrees to run away with him if he does it. But when they mistakenly hear a noise that Roubaud might be approaching, Lantier has another one of his seizures and brutally kills Séverine, instead. 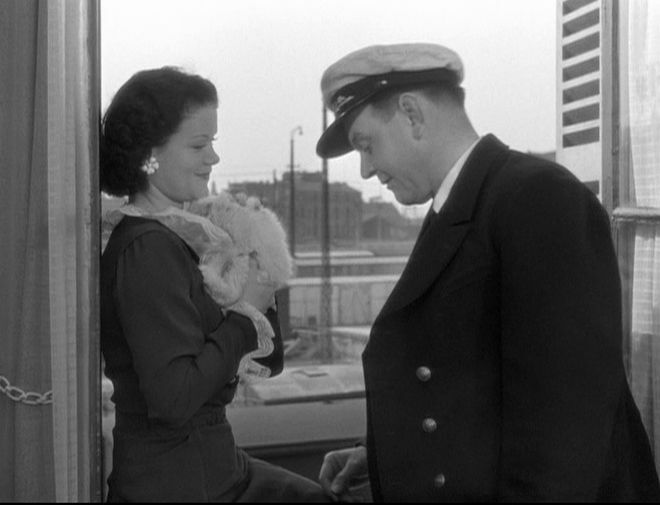 In a stupor he returns to the railroad yard and gets on the train out of Le Havre. 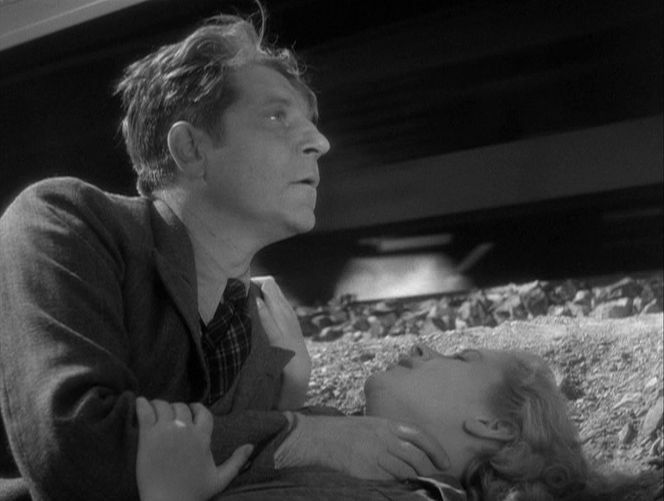 While the train is rolling at high speed, he blankly confesses to Pecqueux that he has just committed murder. Then he seems to have another seizure, attacks Pecqueux, and then jumps from the speeding train to his death. With a plot structure like that, one can only marvel at how Renoir made an inter esting film out of it. Many of the actions in the story, at least as presented on film, lack convincing motivation. Not only is Lantier’s violence mindless, but Roubaud’s jealous psyche is bizarre: he first obsessively murders Grandmorin and then later seems unaccountably indifferent to Séverine’s infidelity with Lantier. All three principal characters, Lantier, Séverine, and Roubaud, are driven by some unexplained inner compulsions to do things that can only make themselves and others around them miserable. Lantier, of course, is the most obvious case, since his fits of madness are directed at targets most precious to him: Flore, Séverine, and finally, his own life. Roubaud is also self-destructive, although on a smaller scale. And Séverine, who despite always seeming to have a smile on her face, actually sees herself as a miserable, tormented woman who must find a way to free herself. One might be tempted to view these three characters as simply odd, disturbed individuals – outliers who don’t deserve our sympathy. And yet Renoir manages to evoke out compassion for all three of them. Even Roubaud seems, for the most part, to be a pathetic individual. By humanizing them, there is an implicit suggestion that all of us have a “beast” lurking inside of ourselves, just as much as we may also have an inner “Buddha”, as well. A word must be said in this respect about the acting of Jean Gabin, as Lantier, and Simone Simon as Séverine. At this time Gabin was at the height of his career and was the star of a string of movies by Marcel Carné, Julian Duvivier, and Renoir during these years. In all cases he embodied the ideal image that Frenchmen had of the common man – that of a sturdy, honest man of natural integrity. This was the French period of the National Front, with its liberal ideals of uniting all classes under a common banner. Gabin had the straightforward style that appealed to both women and men during this period. 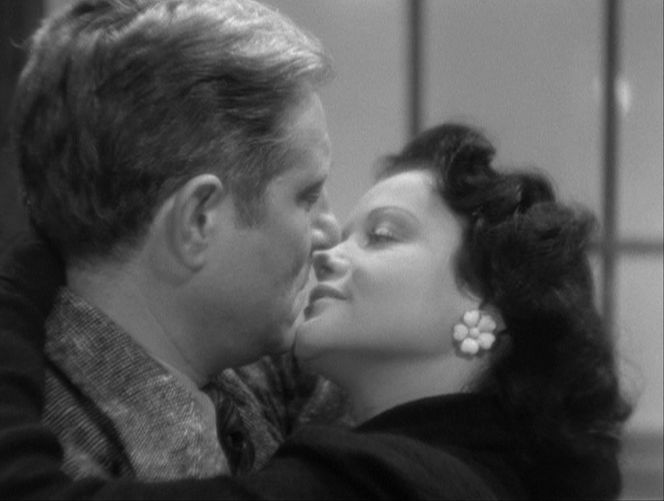 Simone Simon, who would later go to the United States and appear in Cat People (1942) and The Curse of the Cat People (1944), was not quite such a stellar figure at the box office, but she is absolutely magnetic here in La Bête Humaine. She manifests the innate qualities of a truly seductive femme fatale: she projects the innocence of a person that is so natural and compelling, probably even to herself, that one fails to see the underlying destructive selfishness. Renoir captures the mood and feelings of the relationship between Lantier and Séverine, especially during their tryst on the rainy night, with artful studio lighting that emphasizes the almost secret emotional sanctuary that their relationship confers on them. Such scenes contrast with the raw, brute nature of the railroad trains that symbolize the uncontrollable forces that dominate their lives. Renoir bridges this contrast by his unique mise-en-scène, which shifts smoothly between intimate closeups and camera shots from a distance. Some critics site Renoir’s penchant for “framing” his shots through door and window frames, but I think this is more a matter of maintaining the camera at a certain distance, perforce physically locating it outside the room. This both distances the viewer somewhat from the scene and also situates the characters in the environment or landscape. Thus he often shows individuals in extreme long shot, dwarfed by their natural surroundings. The resulting effect is to ground the destinies of his players in the greater context that is largely outside their control. The period of the late 1930s was one of growing pessimism in Europe, when Spain was falling apart and Nazi Germany’s bellicosity was increasingly ominous. An air of fatalism was starting to take hold on the European mind. The gloomy atmosphere in Europe has led social commentators to identify La Bête Humaine with Carné’s “Poetic Realism” films, Le Quai des Brumes (1938) and Le Jour se Léve (1939), although there are some stylistic differences between Renoir and Carné. Renoir’s focus covers a broader spectrum of characters who are grounded in a particular situation and circumstances. Carné, on the other hand, tends to focus more closely on a single characters, whose environmental situation is more distant and abstract. 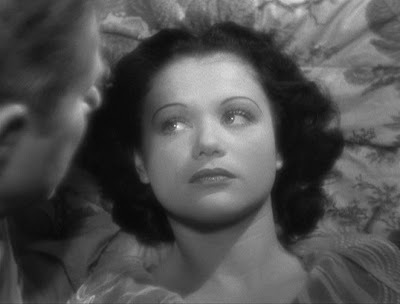 Renoir and Carné have also both been identified with a narrative style that was later to be called film noir. To be sure, it is hard to find a more seductive femme fatale, a signal feature of film noir, than Séverine in La Bête Humaine. But since Lantier’s violent actions are so unmotivated and contradictory to his own desires, La Bête Humaine has a kind of philosophical despair to it that puts it on a different level from the romantic/existential despair of Le Jour se Léve. This is both a strength and a weakness. On the negative side, we have to admit tha t Lantier’s sporadic insanity has a distancing effect on the viewer, because his violence is so thoroughly unmotivated. On the positive side, though, this distancing supports Renoir’s stepping back and surrounding Lantier in the larger context and more uplifting milieu of working-class camaraderie and solidarity, embodied by the loyalty of his friend, Pecqueux (played to perfection by Julien Carette). At the end of the film, Renoir altered Zola’s catastrophic ending (in which an on-train fistfight between Lantier and Pecqueux led to them falling to their deaths, thereby dooming the train full of passengers) and closed with Pecqueux and the other train workers returning to work.